A Big Weekend of Aussie Racing! It seems that it is tough being popular! There has been a delay to stock of the Cougar KF arriving in Australia because of the unprecidented demand for this 2wd Buggy. There is no denying that this is one desirable buggy, and that we will see more of it and it’s KR sister in 2014 as 1:10 buggy classes continue to grow in popularity. I know it’s late notice, but then we haven’t been about a week as yet! This event is starting TODAY! Being held at the Gold Coast RC Raceway at Arundel, this event has attracted over 100 entries with a few big names in attendance. Whilst entries have now closed, if you are in the area make sure you head in to see the action. More information can be found at the RCTech thread or on the Gold Coast RC Raceway facebook page. Scott Giles reports from the Victoria State championships in Australia where he scored a fantastic victory for the new Schumacher Cougar KF 2WD buggy. The prestigious Victorian State Titles were run and won on the weekend of Nov 30/Dec 1, in Australia, with the Schumacher Team represented by Scott Giles in the spec motor classes, and Leigh Cheeseman in modified. With entry numbers pushing 200, and temps over 30 degrees Celsius for the weekend, there was sure to be some hot action. After some lazy test laps during the afternoon on Thursday, the track was officially open on Friday for practice, with 5 x 4min rounds to each class and driver. With the brand new Schumacher Cougar KF in hand, but completely untested, I used the time to run 2min with each car until deciding that the KF was the way to go. Friday left both Leigh and I confident of our rides for the weekend. Saturday was to be the 4wd day of the titles, and with 4 qualifiers in the books, both Leigh and I found ourselves in the top 5 in our respective classes. Leigh in the 5 spot, and myself starting out of 2 with our K1′s. With some poor starts and mistakes in the opening laps by my self, I was chasing the lead cars in every final, and also turning the fastest laps of the day. The result was to be a reverse from the National Titles earlier in the year, and I finished second with some hard charging runs. Leigh also had a great day out, managing to maintain his fifth qualifying position in one of the best modified fields assembled since the Nats. Sunday saw some very strong fields assemble for the 2wd competition, and with the track forming a blue groove in most sections, but also becoming bumpier and more rutted, I was torn with the decision of which 2wd car to use. The KF to me just felt easier to drive fast though, so I stuck to my guns and debuted the new car in Australia. The choice proving to be the right one, I topped the leader board in rounds 2 and 3, seemingly securing me the TQ, however, the round 1 winner had other ideas and drove a superb race to eclipse my time and take the round win in the 4th. I would start 2nd on the grid. After using the 4th round to push the KF beyond its limits though, I knew where I needed to be for the finals. Leigh was having a great run with his SV2 also, proving to be consistently amongst the quickest, and again securing the 5th grid position. Leg 1 of the finals saw me get off to a great start, shadowing the leader for three laps until he made a small error, I then made a clean pass and went on to win. Leg 2 saw me get involved in the typical first corner mele and chase from mid field to gain a 3rd place finish. Leigh was running great in Mod, with a 3rd and 5th in the first two finals, keeping it consistent really paying dividends on the rough track. In the third leg, I made a clean start and put the KF into the lead on the second corner, never to be headed or challenged, winning the state title, and debuting the KF on the top step of the podium. Leigh again rounded out his day with a 5th overall, a fantastic weekend for the team in Australia, and yet another win on debut for the new KF, on a med-high traction, bumpy clay track!! Not exactly its design brief, but so smooth and stable that it eclipsed all others. New Associated 8th scale Buggy soon? Over at Neobuggy there has been some reports that a new 8th scale buggy from team associated have been spotted testing! 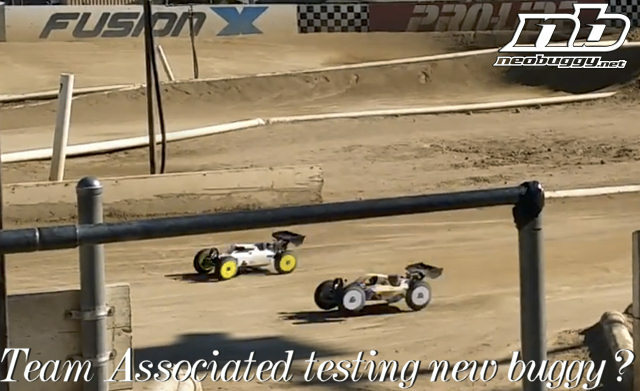 An interesting thread appeared yesterday on RC Tech suggesting Team Associated were down at Revelation Raceway in SoCal testing a (new) car they’d prefer to keep away from prying eyes, cast your minds back to the ROAR nats when we stumbled upon a hush hush test the day after the event whereby another plain white-bodied buggy was also seen on track, although not for very long. We also hear that AE’s ‘man in Europe‘ Yannick Aigoinmight have tested a new car a month ago at the track in Reims, host of the Euros a few months earlier. It will be interesting to see what design features this new buggy may have! Action RC and Schumacher have annouced that Darren Lord will continue to campaign Schumacher buggies on the Gold Coast for 2014. 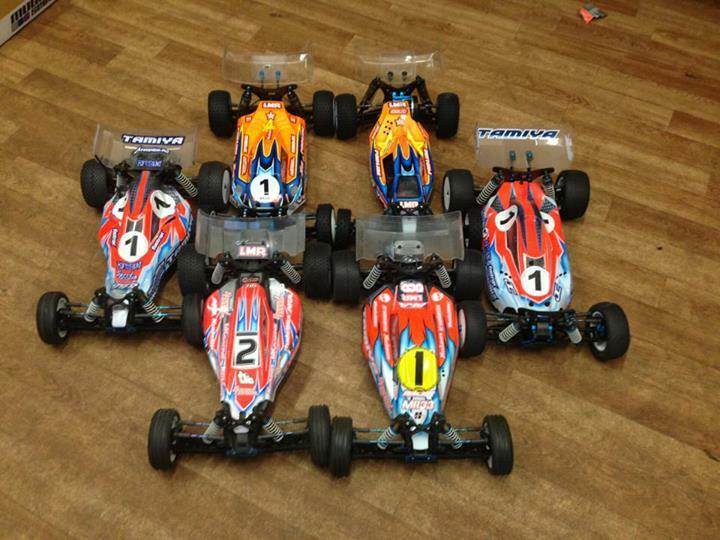 Running the latest batch of Schumacher cars including the K1, and Cougar KR and KF buggies. We are pleased to be able to say that Darren Lord will continue to campaign Schumacher buggies for 2014. Darren will initially run the KR and K1 at the Gold Coast and a new KF will be got ready in the new year for testing for use at the Gold Coast and other major events where a forward motor buggy might be advantageous. Lee martin announced this morning on his facebook page that he would be parting ways with Tamiya TRF as they are reducing their off road operations. We wait with interest to see where Lee lands! With this decision, the future now lies somewhere new in 1/10th off road! A challenge I am looking forward to taking, but nothing is yet decided. For sure it’s going to feel strange for a little while. On Saturday the 14th of December the club will be opening for a Working Bee. It would be largely appreciated if the club members and non members could attend and help with the cleaning up of the track and surroundings. When the works are complete the track will open for practice for all those that helped with the working bee. It is always difficult to publicise major events to attract drivers to Attend, so we thought we would help by putting up a calendar of major racing events on our very own Racing Calendar. AARCMCC provide no such calendar across all sections, and not all clubs are AARCMCC affiliated. So if you have a major event, send us the details via the Contact Us page and we will put the details up for all to see! Team Durango has released details of it’s freshly updated DEX410V4 off road buggy. The changes are evolutionary rather than revolutionary, but the changes reflect what appears to be a solid increase in strength and ease of maintenance.